Avail from us a comprehensive range of Pre Galvanized Sheet Metal Components that are used for variegated applications. 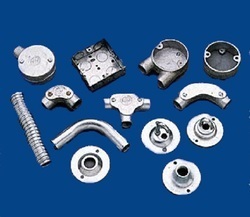 Our sheet metal components find application in engineering, automobile, mechanical and other industries. We are only looking for Export Queries from Gulf Countries like Oman, Iraq, Iran, Saudi Arabia, Syria, Jordan, Kuwait, UAE etc. Driven by an approach of total customer satisfaction, we offer an exhaustive array of customized sheet metal components, that find usages in automotive and other industries. The sheet metal of these components is corrosion and abrasion proof and provides the components optimum durability. We offer these customized sheet metal components to our clients at customer friendly prices. Catering to the requirements of our clients, we are involved in offering Galvanized Metal Sheet. We offer an extensive range of Galvanized Sheet Metal Products for various industries such as automobile, lighting and others. These components can also be customized as per the specific requirements of our clients and is available at industry leading prices. We offer the Galvanized Metal Sheets which are manufactured by the well-famous companies of India. The Galvanized Iron Sheets are made of premium quality iron owing to which their long lastingness is guaranteed. The latest sophisticated technology is used in their manufacturing process.